While trying to avoid the high RV park prices of a holiday weekend, Pam and I decided to boondock for three days at the unofficial Cabela’s RV park. As we travel about enjoying the full time RV lifestyle we try to average about twenty dollars per night for our camping fees. We do that by occasionally seeking refuge in an approved parking lot site. We also use camping club memberships when we are not on a monthly or weekly rate. 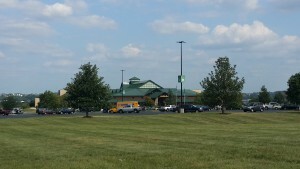 There are the usual places to stay like Walmart, Home Depot, Lowes, Camping World and rest areas, but we recently discovered that Cabela’s serves the RVing public too. 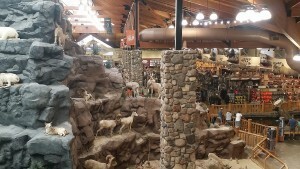 So we checked out the Cabela’s RV park in Hamburg, PA.
Now I have not spent much time at a Cabela’s store before, but we have family that like to hunt and they speak highly of their offerings. I have read other comments about Cabela’s that state that the store is like a Home Depot for people who like to kill things. I did find that comment very amusing but know it is somewhat controversial as many people are passionate about hunting and fishing. I have never had that propensity, but I did enjoy visiting one of their stores! We were in Pennsylvania near the town of Hershey and we needed a three-night stay at a place that would not cost us the usual RV park fees. 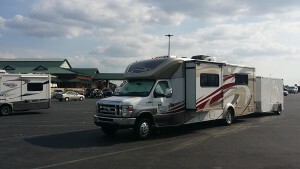 We used freecampgrounds.com and found that the Cabela’s in Hamburg, PA would allow RV’s to park and stay at no charge. They have a row in their parking lot that will handle many RV’s and it is marked accordingly on the east side of the parking lot. They have access to non-potable water for aiding in reducing fresh water usage for sewer needs, and they also have a dump station available if needed. That is why I have given this location the name of Cabela’s RV park! We showed up on a Friday afternoon of the Labor Day weekend. There were plenty of spaces to park. We chose to be close to the dump station so we could easily get some non-potable water, in a bucket, to use to aid in flushing the toilet. This allowed us to extend our fresh water for other uses! The information on freecampgrounds.com asks that once you have parked your RV that you check in at customer service and let them know you are out in the RV area and are spending the night. We asked about spending three nights and they were most gracious in allowing us to do so! The women at the counter even offered the code to the dump station to avoid the five dollar charge for dumping our tanks. We can’t say enough good things about how nice the service personnel were at Cabela’s, and how helpful they were. They even offered best wishes for us to enjoy our stay! I was very impressed with their customer service. I was very appreciative that they allowed us to stay for the weekend! We really enjoyed their store and will visit other locations around the country as we have the ability to do so when in areas they are located! This particular store in Hamburg, PA had many activities other than just shopping. They had a large cafeteria inside on the second floor, they had many animal displays with educational information included, an electronic shooting gallery, an aquarium, hunting gear, fishing equipment, clothing, footwear, guns and ammo, and other related items. You can spend a good portion of the day at this store, if not the whole day. It depends on your level of interest in these things. We observed many other RV’s pulling in and spending the day visiting this store. 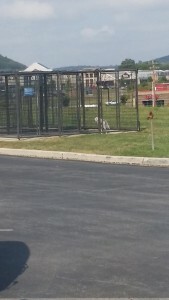 Some folks took advantage of the dog and horse area to leave their pets in an outdoor environment instead of in a hot car while they went shopping. Cabela’s even provides locks for the penned areas if you don’t have your own. There are also other services available nearby if needed: Walmart, fuel stations, and many eateries if you want to avoid cooking in the RV. Most of these can be seen from the Cabela’s parking lot. That is how close they are. We walked over to Walmart for a few incidentals. So, if you are in the Hamburg Pennsylvania area and need a spot to rest for the evening, free of RV space fees, check out Cabela’s RV park. This is a very nice option as long as your RV is set up to comfortably allow you to boondock in a situation like this. If you do, please be respectful of the area and the other RVers that may be there. Don’t look like you are moving in for the long haul with awnings out, chairs, area mats, and grills. That is what ruined it for RVers with Walmart when they started to offer this benefit. Keep it low key and clean up after yourself. Do that and Cabela’s will continue to offer RVers the opportunity to avoid RV park fees while traveling! Since you are in the area of Hershey Pennsylvania are y’all going to the RV show next week? We are all 5 days. Very excited. Yes, Mark and Lauree! We will be at the Hershey PA RV Supershow. Come see us at the Workamper News booth and the RV Inspection Connection booth and say hello. Thanks for taking the time to talk about your experience. We are heading to Cabela’s this Saturday and now plan to spend the night with our travel trailer before moving onto our next place. Very helpful info! We are looking forward to checking out the store. We are fans of Cabela’s. Thanks for visiting our website CJ! We are glad to know we are able to help you better enjoy your RV travels.